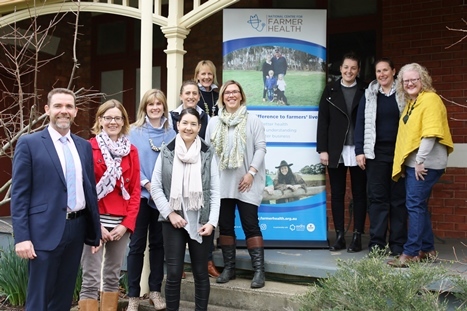 The National Centre for Farmer Health (NCFH) will continue ‘making a difference to farmer’s lives’ thanks to the Victorian Government’s announcement that it will inject a further $4M into the Centre over the next four years. On Friday, the State Opposition also agreed to match the Andrew’s Government offer, providing much needed security for the NCFH to continue delivering its highly regarded services and programs to farmers throughout Victoria and across the country. This year marks the 10th anniversary of the establishment of the NCFH, a partnership between Western District Health Service (WDHS) and Deakin University. The Centre is recognised both nationally and internationally as being at the forefront of research, education, training and service delivery to improve farmer health, wellbeing and safety. WDHS Chief Executive, Rohan Fitzgerald says he’s delighted by the funding announcements, which demonstrate a real commitment to improving the health and wellbeing of people living in rural Australia. “The NCFH is an important voice for over 30% of the population and is a vital platform for highlighting the unique health challenges faced by people living in rural communities. Research suggests that Australians living in rural areas generally experience poorer health and welfare outcomes than people living in our cities. They have higher rates of chronic disease and mortality, less access to health services and are more likely to engage in behaviours associated with poorer health. These announcements deliver much needed certainty to farming communities across Australia and to our staff, allowing us to continue to support farmers to live full, safe and healthy lives”, Mr Fitzgerald said. Since its inception in 2008, the NCFH has reached over 30,000 people through clinics, training, presentations and speaking engagements. Relationships with industry partners have also created strong links with communities across Victoria, assisting the Centre to engage with those most in need. The NCFH delivers post graduate education programs and conducts research into the impact of chemicals on farmers and the stigma of suicide in farming communities. It provides health assessments at field days and supports farming families with education programs to improve health and wellbeing. In recent years the NCFH has also entered into academic partnerships with Universities in India, Indonesia and Germany. Professor Jon Watson, Dean of Medicine at Deakin University and Board Chair of the NCFH also welcomed the funding announcements. “We are very grateful to the Victorian Government and the Coalition for these commitments, which will allow us to continue our vital teaching, research and community support to Victorian and global agricultural communities,” Prof Watson said. The Centre employs 16 people at its headquarters in Hamilton, Victoria, which includes academics, researchers, clinicians, communications and administrative staff.